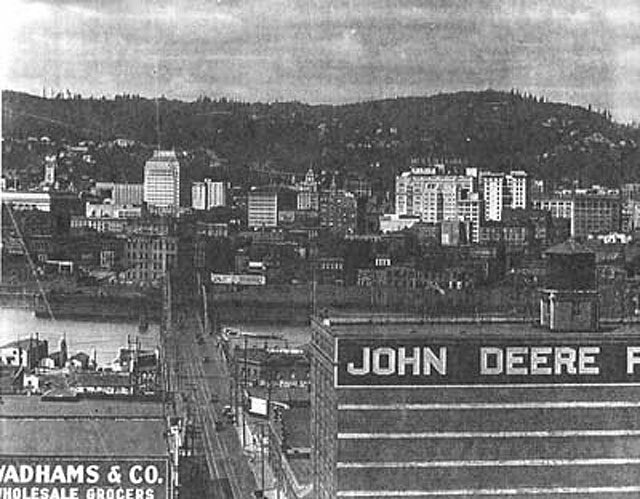 The Morrison Bridge we know today is the third such bridge at the same approximate location. The first one was built way back in 1887, out of wood. At the time, remarkably, it was the longest bridge west of the Mississippi. 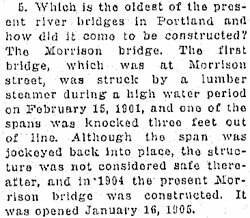 According to the December 3, 1927 Morning Oregonian article pictured to the right, in 1904 it was struck by a lumber steamer, knocking one of the spans three feet out of line. Although the span was jockeyed back into place, the structure was not considered safe thereafter. Construction on the second Morrison Bridge, pictured below, began in 1904, and opened to the public on January 16, 1905. It was built of steel and the price came in under $400,000! The third Morrison Bridge, the one we use today, was built in 1958. Bill, do you still have the original section of the hand railing off the second morrison bridge?